Heel pain can make walking painful. Your feet carry your growing body from the moment you take your first step as a child on forward through life. Very few people consider the wear and tear placed on their feet throughout the years. A common problem experienced as a result of this wear on the feet is heel pain. After putting weight on your feet from walking, running and jumping for many years, nerves and tissues in the heel can experience unfavorable sensations. Pain in the heel can occur as either acute or chronic pain on the back or the underside of the heel. You may overlook a sore heel but unless you get proper treatment or rest the pain will only increase. This pain can hinder your ability to engage in physical activities and significantly affect your overall functioning. You must see a sports medicine doctor if pain becomes severe or swelling occurs. Pain experienced behind the heel happens from excessive running or from wearing shoes that dig into the back of the heel. This pain may worsen gradually over time resulting in swelling, redness or thickened skin on the back of the heel. This pain is at the junction of the Achilles tendon into the heel bone. Depending on the severity and location, a doctor may diagnose you with a ruptured Achilles tendon or Achilles tendonitis. 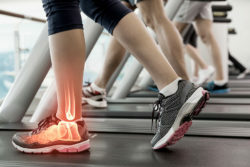 Plantar fasciitis occurs due to excessive running or jumping which causes inflammation in the area where the heel bone connects to the toes. Pain in this area may be relieved after rest but quickly reoccurs after standing and putting weight on the bottom of the foot. Untreated plantar fasciitis can lead to a heel spur in which a calcium deposit builds up on the tissue band that bridges the heel to the toes. What is the treatment for heel pain? If you suffer from pain, sports medicine may be a great option for natural pain relief. Our sports medicine doctor here at Spinal Rehab & Sports Medicine can help. Dr. Bob Meyer has 21+ years of experience treating sports injuries and patients with chronic pain. He has a large arsenal of sports injury treatment methods that can help you find relief from pain fast.